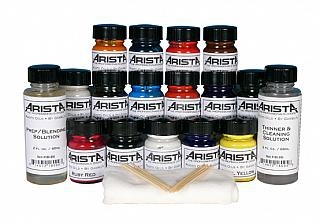 Each bottle of Arista Photo Oils contains 15ml of paint. This is approximately 4 - 5 times more than the volume of the small 1/2 x 2 inch oil tubes (e.g. Marshalls). Prep/Blending Solution - 2 oz. Thinner/Cleaning Solution - 2 oz.